Laura: Do I know him? Laura: Do you know him? I had recently become a fan of both Guillermo Arriaga and Alejandro Gonzalez Inarritu's work through their previous four films Amores Perros, 21 Grams, The Three Burials of Melquiades Estrada, and Babel (in order of release). In hearing of their creative break-up, it certainly stirred, in my own mind, a possibility of double the good films... or a film-making battle accomplishing nothing. "The Burning Plain" by Guillermo Arriaga is the first of these fruits. Good or bad? You decide. I think good... but missing something. 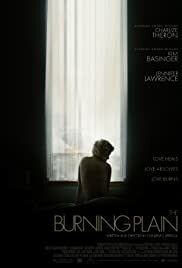 The Burning Plain follows the story of several different people separated by time and space -- Sylvia, a woman in Oregon who must undertake an emotional odyssey to rid herself of her past; Mariana and Santiago, two teenagers trying to piece together the shattered lives of their parents in a New Mexico border town; Maria, a little girl who goes on a border-crossing voyage to help her parents find redemption, forgiveness, and love; and Gina and Nick, a couple who must deal with an intense and clandestine affair... because they are both married. Charlize Theron leads the ensemble cast. Theron, I have previously seen in a consortium of roles from Sleepwalking and Monster to The Italian Job. I am glad to say she brings a much more subtle feeling to Sylvia, the central character in the film, without going over the top. The sides we see from the past and present also reflect Sylvia's personality; a side of professionalism brought in by a new skin in the present while her not-forgotten past hiding deep within but brought out by her sexual trysts and self-mutilation. Also leading the present side of the story is newcomer Tessa Ia in a challenging role she takes at face value despite her young age. With Mexican actor Jose Maria Yazpik in a gentle role, along with Theron, the three are arguably the best actors in the film. Ia's performances hails true talent and not nearly enough credit. With a fierce look in the eyes of a child trying to obtain forgiveness in her own soul, Ia is an actress mature beyond her years. The present stories take on these subtleties that audiences will figure out after the film has ended. This is where the second half (figuratively speaking) of the film suffers. Focused too much of what is going on in a certain time in the past, the characters of Gina and Nick suffer due to a lack of development. We know of their affair, we know what is going on and we are given too much of that without enough understanding of who they are on their own. Kim Basinger does her best in the role but ultimately is too flat with her delivery. Gina is a sympathetic character because of the screenplay and where the writing takes her, not because of Basinger's performance. Joaquim de Almeida's Nick is more interesting despite a lack of screen time, also due to the lack of development. The story of Mariana and Santiago is much better because it escapes from this problem and we are given a beginning, middle and end to their story (per se). JD Pardo gives a nice understanding to Santiago and allows for a much better look at the character as an adult when you finally realize who it is (I will not give anything away). However, Jennifer Lawrence as Mariana is probably my most disliked actor of the group. Despite winning the best newcomer award at the Venice Film Festival, her delivery is monotone and lacks any sort of true feeling for what has happened. This also counts for in between two sections of her life... but a nice reaction to a certain event ultimately saved her entire performance. The film has amazing undertones that audiences won't figure out until later. There are several different themes played on such as the theme of love which is included not only through relationships, though this is the main ingredient, but from children to parents, siblings, and great friendships. The latter is what genuinely seals this aspect of the film as Jose Maria Yazpik and Robin Tunney's characters bring their perspective leads to a connection. Another underlying theme was that of scars. Whether through self-mutilation or a past surgery, Sylvia, Santiago, Mariana, Maria, and Gina all end up with (literal) scars by the end of the film that they cannot forget about eluding to the main theme of the film that the past effects the present. I was hoping that it wouldn't be just a carbon copy of what Inarritu has done before (in an attempt to win an audience). I felt the same way about Three Burials which is why I have rated it with only 8. This is going to be the first major problem for Arriaga on his own creative path. While unfortunate, it is inevitable: audiences will go in expecting the same intense fair Innaritu has been giving them and will see a more tame version of that. Luckily, the wonderful production values and gorgeous cinematography by veteran Robert Elswit and John Toll, tacked on with a beautiful soundtrack, ultimately send the story flying. With a number of events occurring through the story, you are never left bored. Piecing together the puzzle isn't really as difficult as it may seem. For Babel it was all about figuring out which story was in what time period. In The Burning Plain it's about who is who and how time has taken it's toll on the characters, which makes it much more interesting in a more creative way. 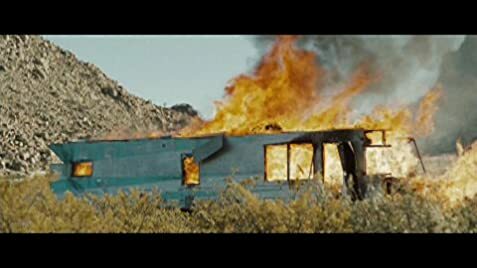 This is where direction suffers as it is obvious Guillermo Arriaga was more focused on the story than he was his actors, but it all falls together without disrupting anything. Hopefully the creative split will allow audiences to realize there is a large difference between directors and Arriaga and Innaritu are no exception.